If you have any Park maintenance issues please remember to call 311. You may also visit the 311 website. All programs are theme-based. Click here for a description of the themes for each site. MUST BE A SPRINGFIELD RESIDENT! All Summer 2019 Registrations take place at Cyr Arena in Forest Park. Cyr Arena is the indoor ice skating rink located next to the swimming pool and basketball courts in Forest Park. Forest Park Vehicle Fee: All parents/guardians coming to Forest Park for registration MUST pay the $3.00 (in state vehicle) to enter Forest Park or have a City park season pass. NO EXCEPTIONS. You may download the paperwork from our website (see the lniks below). Bring the completed paperwork with you to registration. This will speed up the registration process. PLEASE NOTE THAT ATTENDING A REGISTRATION EVENT WITH COMPLETED FORMS DOES NOT GUARANTEE A SPOT IN THE PROGRAM. WE WILL NOT ACCEPT MAILED REGISTRATION FORMS. FORMS THAT ARE MAILED WILL BE VOIDED. Tennis Balls and Racquests will be provided. Participants need to wear sneakers. Annual Richard W. Childs Sr. Learn to Swim - The City of Springfield's Aquatics Department offers swimming lessons at a wide variety of levels. All Learn to Swim classes are available to participants ages three years and up. From getting your child comfortable in the water to perfecting your strokes, our program has everything needed to watch your child, or even yourself, grow into a strong and confident swimmer. Click on the link for more information! 02H (Overweight to Healthy)- This aquatic fitness program is designed to meet the specific needs of those who are extremely overweight or obese. Exercising in the water allows for low-impact movements that increase range of motion and circulation. Whether you are simply walking or using our aquatic fitness equipment for extra resistance, we can offer a personalized workout for you at your own pace. No swim experience is needed! Click the link for more information! Lifeguard Training Classes- If you are at least 15 years of age and want to become a lifeguard, call the Aquatics office to sign up at 413-787-6298. The lifeguard training is a great way to earn extra money after school or over the summer! It is also a step in the right direction for a job in the medical field. Many of our lifeguards go on to be EMT's, Paramedics, Police Officers, Fire Fighters, and more! Special offers apply to Springfield Public School students! WSI (Water Safety Instructor) - If you wish to be certified to teach swimming lessons, this is the program for you. Help children from the ages of three and up learn how to swim and feel more comfortable in the water. It is a great way to earn extra money whether you are a student or someone with another full time job. The City of Springfield offers this course at a very low rate compared to other organizations! Call the Aquatics office for more information! PLEASE CALL THE AQUATICS OFFICE AT 413-787-6298. For flyers and additional information please visit the Aquatics page. Public skating is offered at Cyr Arena in Forest Park on Friday and Saturday evenings from 7:00 p.m. – 8:50 p.m. and Sundays from 2:00 p.m. – 3:50 p.m. beginning on Friday, October 5. There is a $5.00 admission fee ($3.00 for youth) and a $4.25 skate rental fee. Birthday parties may be scheduled please call 787-6438 after 4:00 p.m. for booking and fee information. 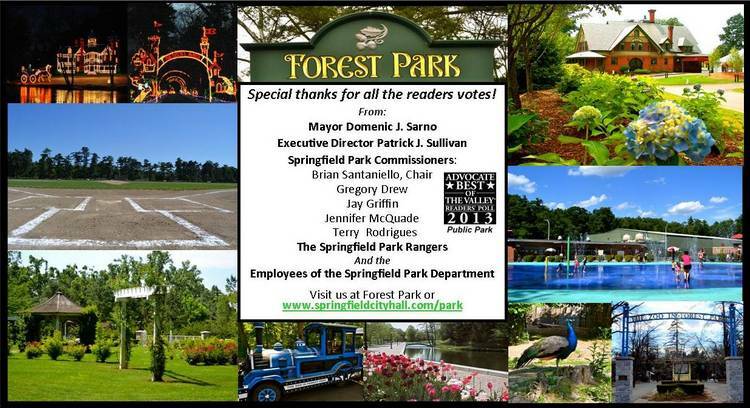 Valley Advocate Votes Forest Park Best Public Park 2013! With 736 acres of open space and a variety of recreation options for the whole family, Forest Park, the crown jewel of Springfield, has been voted the best public park in the Pioneer Valley by the Valley Advocate! Stop by today to see what’s blooming! Looking for a free afterschool program that provides a safe, fun-filled environment for your children with lots of opportunities for hands-on educational and recreational activities to support what they do during the school day? The Recreation Division of the Department of Parks, Buildings and Recreation Management (DPBRM) runs afterschool programs at six elementary schools located throughout the city and funded by the City of Springfield and the Massachusetts Department of Elementary and Secondary Education (DESE). Programs start the week of December 3, 2018. For more information call 787-6434. "Firsts Things First - Celebrating Springfield"
The City of 50 Firsts! The Springfield Department of Parks, Buildings & Recreation Management offers a variety of recreational sports leagues to city residents. Want to register someone for a particular sport? Here's a list of contacts.